Rev. C. Anderson Davis - the Grandfather of Juneteenth, was born July 7 in the coal town of Pocohontas, Virginia. The town was noted for having a very excellent school system. He attended both public and parochial schools. He finished the city's public school a year earlier, and then went on to the county schools. He was blessed to have competent and caring teachers in both school systems during his ealier years. His father was dissatisfied with all the inadequate equipment in high school and being a good father, he wanted to make sure his son received the best education possible; so he enrolled him in a Methodist church school in Morristown, TN. From there he attended Clark College in Atlanta, GA. He studied two (2) majors, one in Social Sciences and one in Physical Science. There at Clark College he pledged Alpha Phi Alpha Fraternity, Inc., and was later the Editor in Chief for the Sphinx Magazine. Later, Rev. C. Anderson Davis enrolled in Gammon Theological Seminary and became one of Gammon's Outstanding Theo Logs. Four years later, he was chosen to receive a scholarship to attend Boston University. Further, Rev. 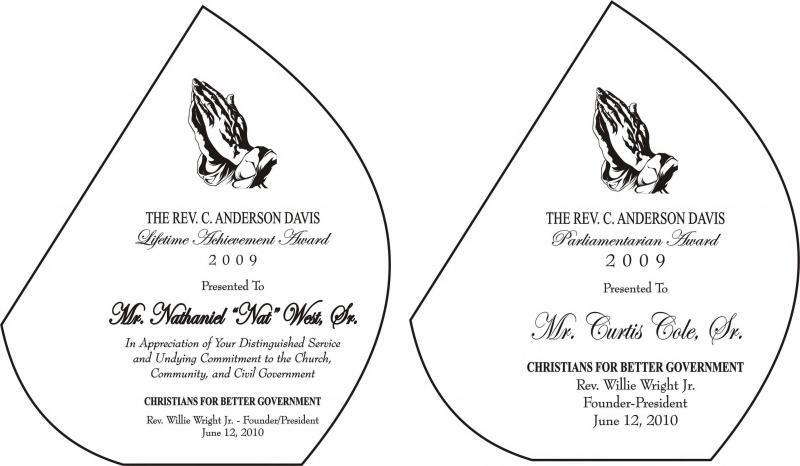 Davis was privileged to pastor Methodist churches for more than two decades. As his life progressed, he became involved with civil rights and the National Association for the Advancement of Colored People (NAACP). The load was becoming increasingly too heavy and demanding for one to handle. One day at a NAACP meeting, a beautiful charming woman walked in and after the meeting, she sought Rev. Davis and said to him, "It seems like you need some help, a secretary would be beneficial." Needless to say, she has been helping and assisting him ever since. This Dynamic Duo of Rev. C. Anderson Davis and Mrs. Bertha Emma Davis was very connected and shared the vision of a better quality of life for others. They moved to Houston, Texas in 1969 for the sole purpose of reorganizing the NAACP. Rev. Davis strove to ensure equal access and equal protection under the law for all people. Later in 1973 he reorganized the National Emancipation Association (NEA) and thus Juneteenth had new life and the celebration began. Rev. Davis was also a noted African American political consultant, NAACP leader, community activist, and sole drafter of the Juneteenth Proclamation which was later used by State Representative Al Edwards of Houston to make Juneteenth a state holiday in Texas, the first official holiday in the nation for African Americans. Rev. Davis is the original and sole drafter of the proclamation. According to Rev. Davis, State Representative Al Edwards submitted this proclamation (word for word) without Rev. Davis' permission and without citing Rev. Davis as the orignal author. Rep. Edwards plagiarized the Juneteenth proclamation. Rev. C. Anderson Davis drafted the Juneteenth Proclamation. State Representative Al Edwards copied this Proclamation from Rev. Davis' web site (The National Emancipation Association)and introduced this document to the Texas Legislature as though it was his own work. Rev. C. Anderson Davis is the "Grand-Father of Juneteenth." Rev. C. Anderson Davis had a very soft spot in his heart for children, senior citizens, and the disabled. Also, he worked diligently to provide quality independent living and activities for the elderly and disabled. Through the National Emancipation Association Credit Union, which he established, countless scholarships and financial assistance were awarded to many inner city students who wished to further their education. Aspiring African American businessmen and entrepreneurs who did not qualify for a traditional bank loan could borrow from the credit union for their start up business(es). Rev. Davis firmly believed that since God is a God of "decency and order," every aspect of life should reflect those qualities and traits. He believed in managing money wisely. Rev. Davis purchased a vehicle in 1979. He drove and maintained that same vehicle until his death in 2007. He never purchased another vehicle. Rev. Davis did not permit alcohol beverages to be sold or served at any of his public functions. He wanted all of his social events to be family-friendly and alcohol-free. When beer distributors and alcohol vendors offered him money to set up booths, his resolve never began to waver. He would always choose dignity over dollars. He was guided by principles and not by popularity. He was more interested in the approval of God than he was in the acclaims of men. His fiery personality and excellent command of parliamentarian procedures (the Robert's Rules of Order) always provided for a very exciting and most spirited meeting. Under his leadership as Chairman of the Political Action Committee (PAC), there was always money in all of the organizations' bank accounts, all bills, expenses, and creditors were promptly paid. As PAC Chairman, Rev. Davis was foremost in utilizing the media such as the printed press to promote slates of candidates. Under his leadership, during early voting, general and primary elections, run-off elections, special elections, etc., the voting public including candidates/officeholders could count on reading the endorsements of the slate of candidates published in the local newspapers such as The Houston Post, The Houston Chronicle, The Forward Times, The Houston Defender, and The Houston Sun newspapers. This would continue without interruptions. He believed in taking a stand for what is right and supported those candidates/officeholders, measures, and referendums that represented the best interest of the community. Rev. Davis is the last surviving child of his parents, the late Charles Thomas and Alice McClannahan Davis. He was survived by his wife, Mrs. Bertha Emma Davis, and two step-daughters, Mrs. Jacqueline Annette (Bruce) Houston and Dr. Michaele Paulette (Clarence) Penn, several neices and nephews. Before his death on Monday, April 30, 2007, he had remained a devoted husband and a faithful church member. He wife later succumbed to her death on July 28, 2007. Rev. C. Anderson Davis believed that if you keep your dream alive and stand firm in your beliefs, much can be achieved. His passion and purpose were to gain and protect human rights and freedom for all Americans and to provide quality living and activities for children, senior citizens, and the disabled. According to Rev. Davis, getting everyone along is more important than getting along with everyone. Rev. Davis' last words to me after he had become seriously ill and unable to care for himself were: "Carry on in my name." Later, while attending his memorial service, I promised his wife, who was wheel-chair bound and also very ill, that I would do whatever I could to keep his name and legacy alive. Rev. Davis was eulogized Friday, May 4, 2007 at 1:00 P.M. at Fourth Missionary Baptist Church located at 2710 Webster Street, Houston, Texas 77004. Rev. Walter Houston presided and Rev. Floyd Williams, Sr. served as eulogist. His body was laid to rest Sunday, May 6, 2007 at Restlawn Memorial Gardens Mausoleum in Bluefield, West Virginia. Proverbs 31:9 - "Open thy mouth, judge righteously, and plead the cause of the poor and needy." Midwestern Vice President of Alpha Phi Alpha Fraternity, Inc. This award is presented to an individual who has served as an active member, leader, and supporter of a community-based organization for the past five (5) consecutive years and administered the Robert Rules of Order as his/her parliamentarian authority to further the cause of the community. This award is presented to an individual who has maintained an undying and an uninterrupted commitment to the Church, Community, and Civil Government for the past twenty (20) consecutive years. 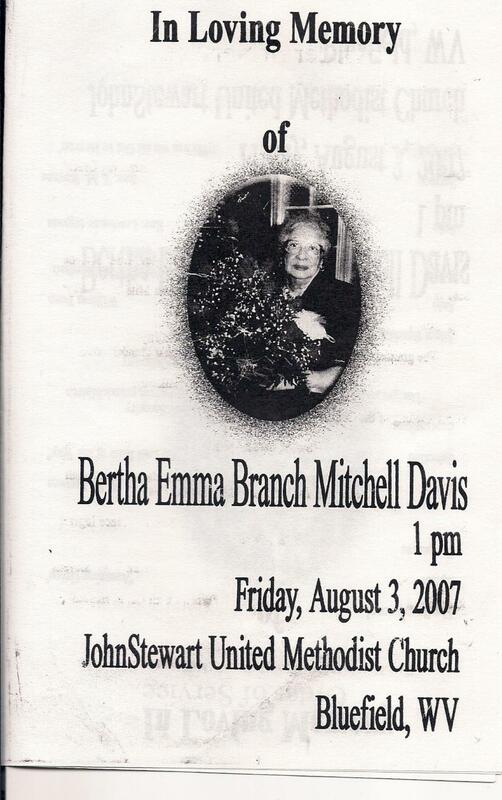 Bertha Emma Branch Mitchell Davis departed this life on Saturday, July 28, 2007. Born June 28, 1919 in Oak Hill, West Virginia, she was the eldest child of the late John Branch and Agnes Toliver Branch of Fayette County, West Virginia. She graduated Valedictorian from Dubois High School (1937) in Mount Hope, West VA before attending Bluefield State College for three years. She interrupted her education when she met and married the late Desmond Langston Mitchell (1917-1973) of Bluefield and had two daughters, Jackie and Paulette, during that marriage. In 1968 she returned to Bluefield State College and graduated in 1970. She became a member of the Delta Sigma Theta Sorority. During that time she married the Rev. 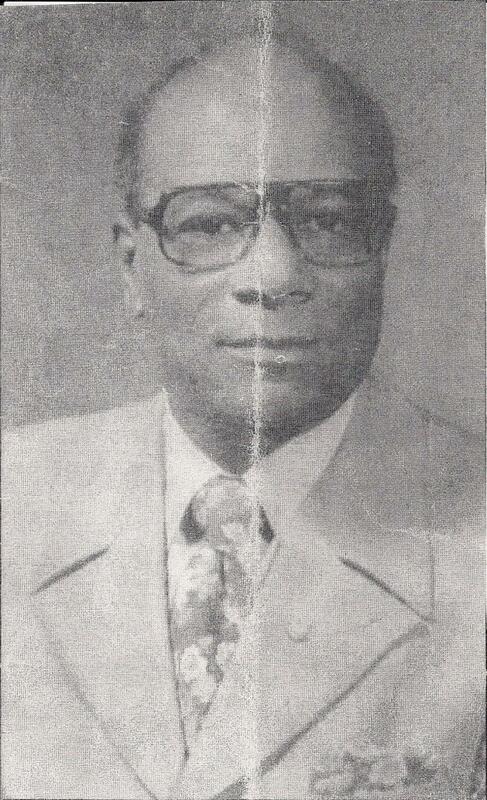 C. Anderson Davis, Pastor of John Stewart Methodist Church. After teaching for a short while in Natural Bridge, VA, she and Rev. Davis moved to Houston. TX where she taught Reading, English, and Literature at Jack Yates High School for the Houston Independent School District until she retired in 1991. All the while in Houston she worked diligently beside Rev. Davis in restoring the Juneteenth Celebration through their work with the NAACP and the National Emancipation Association (NEA). She also sat on the board of the Anna Dupree Terrace Assisted Living Facility and worked tirelessly in the NEA Credit Union to help elevate the poor and struggling citizens of Houston. She served as treasurer for the Harris County Council of Organizations (HCCO). She was preceded in death by her husband on April 30, 2007. She was also preceded in death by several siblings --- her brothers Bill, John Henry, and Andrew Branch and her sister Betty Branch Morrison. She leaves to cherish her memory two daughters, Mrs. Jacqueline Annette (Bruce) Houston and Dr. Michaele Paulette (Clarence) Penn; two sisters, Mrs. Harriet Little of Youngstown, Ohio and Mrs. Naomi Urbina of New York; one sister-in-law, Mrs. June Glover of Williamson, West VA; four grandchildren, Mr. James D. Sims and Ms. Ophelia C. Sims of Bluefield, West VA, Mr. Michael D. Sims of Harrisonburg, VA, and Dr. Michelle Penn-Marshall of Chesapeake, VA; six great-grandchildren, thirteen great-great grandchildren and a host of nieces, nephews, other relatives and friends. 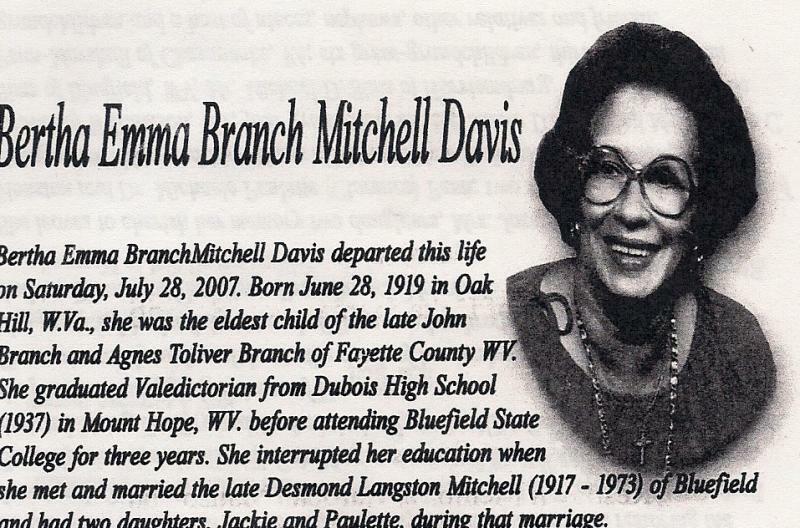 Mrs. Davis was funeralized on Friday, August 3, 2007 at 1:00 p. m. at John Stewart United Methodist Church in Bluefield, West Virginia with Rev. Homer Davis serving as Pastor and Rev. T. M. Stevens serving as eulogist. Also, her body was laid to rest in the Restlawn Memorial Gardens Mausoleum on Littlesburg Road in Bluefield, West Virginia.